Beautiful engraved RARE specimen certificate from the Transogram Company, Inc dated 1969. This historic document was printed by De La Rue Banknote Company and has an ornate border around it with a vignette of the company's logo. This item has the printed signatures of the Company's President and Secretary and is over 45 years old. Transogram Company was incorporated in Pennsylvania on September 4, 1959, succeeding a New York corporation of the same name that was established in 1915. The company was founded by Charles S. Raizen. Transogram made toys, games, playroom furniture, coloring, craft sets, and sports sets under the brand name Transogram. 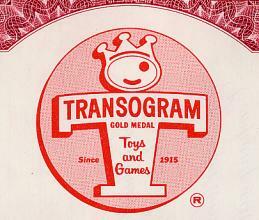 Over the years it added several wholly owned subsidiaries including Anchor Toy Corporation, Playwood Plastics Company, Toy Research Institute, Inc., Toy Scouts of America, Transco Adult Games, and Transogram Midwest, Inc.
Transogram was the creator of many well-known toys. In the 1930s it expanded into the manufacture of games, including �Big Business,� which was introduced in 1935, and �Game of India� and �Tiddledy Winks,� introduced in 1938. It also developed the �Green Ghost� board game, and in the 1950s it sold the very successful �Prince Valiant� board game and a variety of �paint-by-number� sets. 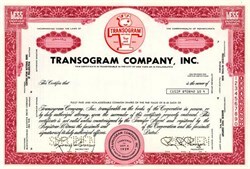 Transogram made an initial public offering of 196,000 shares common stock in May 1962. It was sold from the private account of Charles Raizen at ten dollars per share. After the sale, Raizen retained control of the company through his holdings of 606,000 shares, which represented 61.4 percent of Transogram�s outstanding stock.